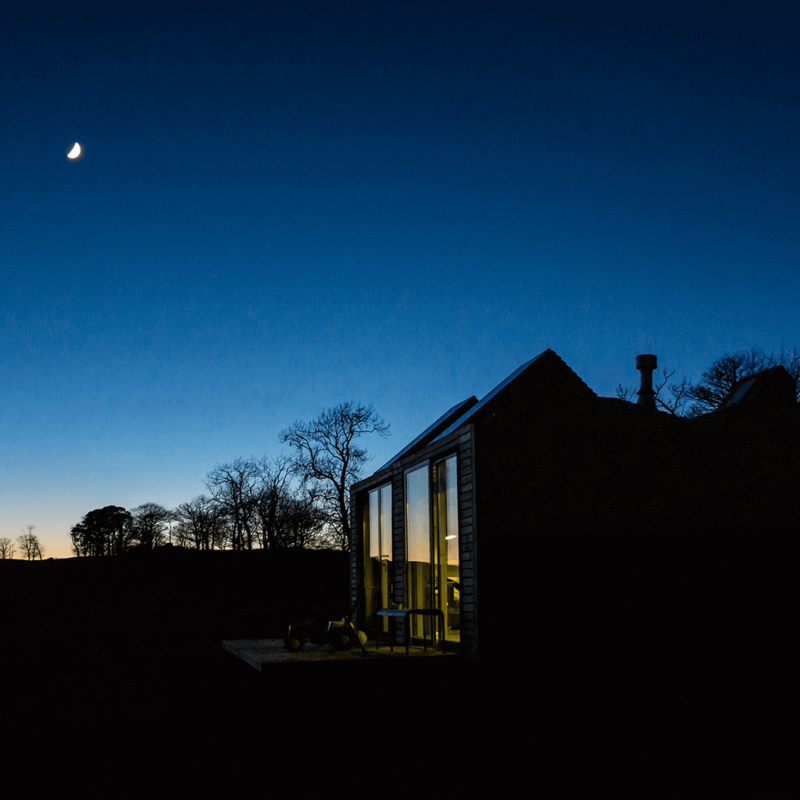 Brockloch Bothy | Eco Holiday Cabin. Brockloch Bothy is a contemporary micro timber framed building which has been sympathetically designed to complement its surroundings. The Bothy is accessed via a farm track (non tarmac) and is signposted up through a bluebell wood out into an open field, grazed by our own black faced sheep. The Bothy includes an open plan kitchen/ sitting room with wood burning stove and sofa bed. The kitchen is fully equipped with a gas hob, oven and there is a full sized fridge in the shed next door to the Bothy. The bathroom has a shower and toilet, with a separate double bedroom. As the Bothy is "off grid" there are no power sockets but 2 large solar panels provide 12v electricity to power low voltage lighting and a point to charge a laptop/mobile phone. Heating is provided by a log burning stove with all wood included in the price. Egyptian cotton bed linen, towels and a 12v hair dryer are also provided. Decking at the front allows you to enjoy the panoramic views over the countryside complete with fire bowl and outdoor seating. Brockloch Bothy actually featured in the first series of the Channel 4 show "George Clarke's Amazing Spaces"?